Jurassic Park is an action game that's based on the 1993 hit movie. A computer malfunction at Jurassic Park has resulted in hundreds of prehistoric predators escaping from their pens; as Dr. Alan Grant you'll need to complete tasks such as activating motion sensors and destroying the raptors' nest before exiting the island. Weapons include a Shotgun and Missile Launcher, and all can be obtained in either the top-down outdoor areas, or the indoor first-person sections. With the former, the game world is sprawling and it's easy to lose your bearings due to the lack of a map; it's not always clear what your next objective is either as the game does a terrible of guiding you. There's little scenic variety and ammo is severely limited which makes combat rather redundant, as you'll be so overpowered by the speedy dinosaurs that you might as well try and avoid them. Hints and tips are often displayed, but they take up half the screen and prove problematic when incoming dinosaurs are partially obscured! The indoor first-person sections are impressive from a graphical standpoint with lots of texture detail. However, once again, without a map it's a tedious process to make headway, and the slow, choppy frame-rate doesn't help matters. The dinosaur A.I. is completely dumb and as long you're at a slight distance they won't bother to attack despite looking directly at you! Saying that, if you shoot whilst a door is opening the SFX of bullets will play, yet no projectiles fire, leaving you open to damage for a split-second! The game's Achilles heel is not having a save or password feature, as despite it being a lengthy, non-linear adventure you're expected to beat it in one sitting! Jurassic Park deserves credit for its lofty ambition and for trying something new, but in reality the execution leaves a lot to be desired. It's almost impossible to beat without a walk-through, and the lack of in-game maps, saves or passwords makes for some laborious play sessions where you spend most of your time wandering aimlessly. 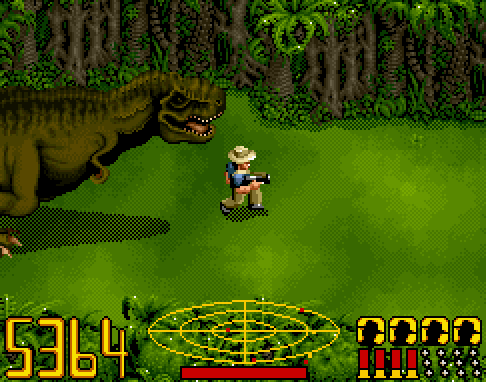 Random trivia: Jurassic Park was also released on the Sega Mega Drive in 1993 but it was an entirely different game and took on the form of a side-scroller.